Park Geun-hye (박근혜, Korean pronunciation: [pak.k͈ɯnh(j)e]; born 2 February 1952) is the eleventh and current President of South Korea. 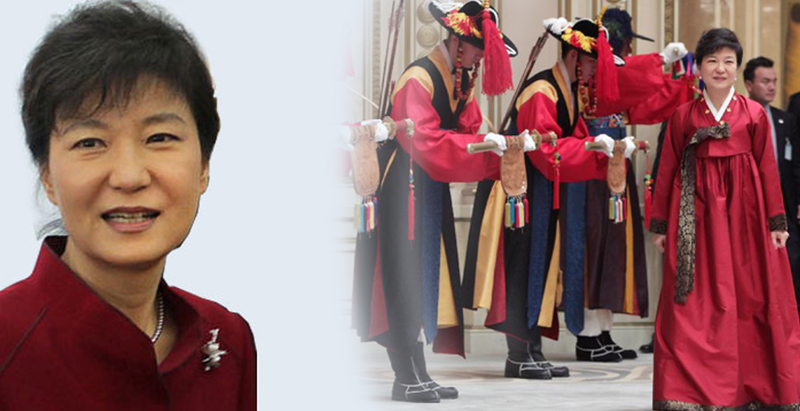 She is the first woman to be elected as President in South Korea and is serving the 18th presidential term. She also is the first female head of state in the history of Korea and is the first South Korean president to have been born a South Korean citizen. Prior to her presidency, she was the chairwoman of the conservative Grand National Party (GNP) between 2004 and 2006 and between 2011 and 2012 (the GNP changed its name to the “Saenuri Party” in February 2012). Park was also a member of the Korean National Assembly and served four complete consecutive parliamentary terms as a constituency representative between 1998 and 2012; she started her fifth term as a proportional representative in June 2012. Her father was Park Chung-hee, President of South Korea from 1962 to 1979. In 2013 and 2014, Park was named the world’s 11th most powerful woman and the most powerful woman in East Asia byForbes magazine’s list of The World’s 100 Most Powerful Women. In 2014, She was named the world’s 46th most powerful person by Forbes magazine’s List of The World’s Most Powerful People, the third highest among Koreans after Lee Kun-hee and Lee Jae-yong.